In spite of the deluge of maple recipes that seemingly take over the interwebs every fall, maple syrup really is a late winter/early spring seasonal ingredient. 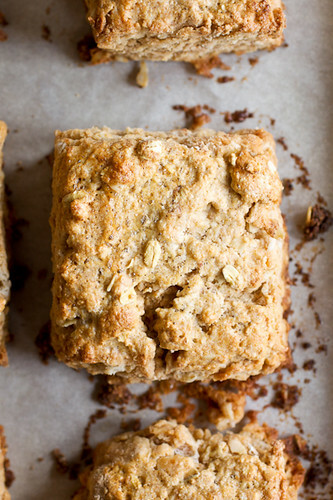 And these oat and maple syrup scones? Well, this recipe has been hanging by a thread on my ever-growing list of things to make since last April. I had plenty of maple syrup leftover from our Vermont trip the previous fall but somehow, I never got around to making them. Of course, I could have just made them any time in the past 11 months but sometimes I get this mental block about using ingredients that are out-of-season. Like, it’s wrong somehow. Blueberries? Major seasonal ingredient. Anyway, these scones are amazingly delicious. The whole wheat flour adds an extra layer of flavor to them in the form of a little nuttiness and the butter…oh the butter! 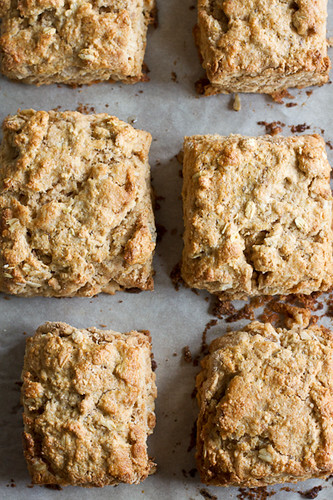 Nearly 3/4 cup butter for 8 scones – not hip-friendly but so, so good. 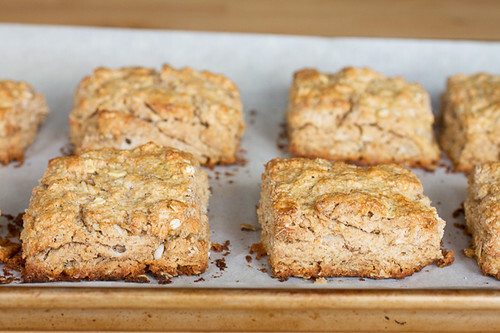 These oat and maple syrup scones aren’t sweet scones by any stretch but you can pull out just enough of the maple to know the intention of the recipe. The tops will turn out super craggy and crunchy and to me, that’s always, always the best part of a scone. And as for the extra batch that I made and froze? I don’t see them lasting through next week. Weigh the flours and oats in a large bowl set on top of a zeroed-out kitchen scale, zeroing out the scale after each ingredient addition. Whisk in the baking powder, brown sugar, and salt. Cut in the butter with a pastry blender, two knives, or your fingers. In a 1 cup liquid measuring cup, whisk the maple syrup, buttermilk, and vanilla together and stir the wet mixture into the dry ingredients just until a dough begins to form. If the dough seems really dry, add some extra buttermilk – only enough to get the dough to come together. Transfer the dough to a lightly-floured work surface and work it into a disc about 1 ¼-inch high with your hands or a rolling pin. Cut out the dough into desired shapes with biscuit or cookie cutters or a knife. I went the way of my stainless dough scraper and simply cut out squares so I wouldn’t have re-roll the scraps. Place the scones on the prepared baking sheet and brush the tops with the egg wash. Before you brush with egg wash, you can freeze them on the baking sheet then transfer the scones to a plastic zipper bag. Bake for 20 to 25 minutes, until they are golden brown. These scones are best served fresh from the oven but they are still pretty great reheated at 300° F for a few minutes even 3-4 days later. If baking frozen scones, add 2 to 3 minutes to the baking time. Perfect for Maple Season!..and this weekend.